Moves are underway by the Construction Industry Development Authority (CIDA) to introduce new regulations to standardise minimum salaries for construction labour force in a bid to attract new talent to address the domestic worker shortage. The Authority has already commenced a pilot project to create a database of workers, through which employers will be able to recruit in order to fulfil their labour requirements, CIDA Chairman M. R. Jeyachandran told Daily FT.
“One way to attract labour is to ensure that proper salary scales are maintained. When there is a set minimum salary for a certain skill level, then there is assurance for the worker regarding what he can earn, so more will be attracted to the job,” he said. The database will hold all details of the worker including skill level and wage details that employers can refer for recruitment, he said. The Authority has already negotiated with the Department of Labour to create an Employee Provident Fund (EPF) number based on the National Identity Card (NIC) enabling workers to have a smooth transition from one employer to another without forgoing benefits. CIDA has already started collecting details of the workforce to create the database in anticipation of regulations that will be put in place in the coming weeks to help standardise the industry, Jeyachandran said. Five regulations regarding registration of local and foreign contractors and other related issues in the industry will be issued in the coming weeks, he added. These will be the first set of regulations introduced after the Construction Industry Development Act was passed in 2014. Regulations on the Registry of Construction Contractors, Registration Procedure and Required Qualification for Quality Assurance Auditors, Registration of Contractors, Registration of Qualified Persons and Technical Auditory Procedures will be gazetted next week. All other regulations concerning different clauses in the act will be gazetted within the next three months, Jeyachandran said. This includes the introduction of regulations governing adjudication procedures for the industry which it lacks at present. The CIDA will also include regulations to register foreign contractors outlining qualifications for registration as well. Once there regulation is in place, all foreign contractors bidding for projects in the country will have to be registered. The registration, however, will be on a project basis. Jeyachandran further said that CIDA has plans to introduce registration procedures for property developers and register and maintain a registry for material supply as well. The move to streamline the sector comes as the Chamber of Construction Industry (CCI) readies itself to recruit its first batch of foreign workers form Nepal and Myanmar to work in Sri Lankan construction projects to address the continuing labour shortage. Approval has been granted by the Ministry of Housing and Construction Industry to recruit 2,500 foreign workers to work in construction projects in the country. The pilot run of the recruitment was successful, CCI CEO Nissanka Wijeratne told Daily FT. The CCI facilitated recruitment of 17 workers to be deployed in a construction project in Sri Lanka. 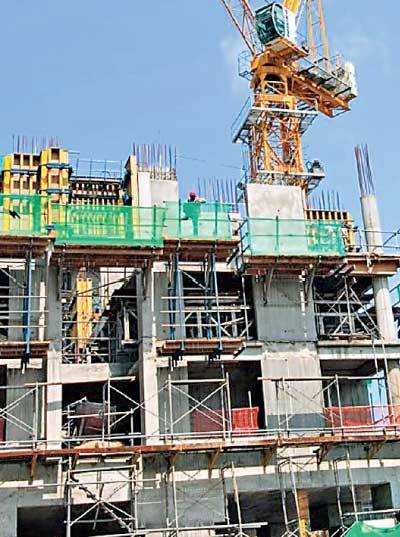 To date, close to 100 workers are in Sri Lanka working in various construction projects, with only one Nepalese worker returning after one month. Another batch of 250 workers is expected by end of March, he said. The workers are recruited by the CCI, depending on the requirements of the members, through two recruitment agencies in Nepal and Myanmar. The CCI has already received applications to recruit 500 workers from its members, Wijeratne said. The CCI recruits the workers on behalf of their members when applications for labour are made by the employers and handles the visa process once approval and recommendation of the Ministry is granted. The expenditure per worker is estimated to be around Rs. 60,000 a month including food and lodging, ticket cost, visa fees and recruitment agent’s fee, which have to be borne by the employer in Sri Lanka for an unskilled worker. This will increase to about Rs.70,000 for a skilled worker with past foreign experience. The workers are recruited based on skill level through vocational training certification recognised in their respective countries, Wijeratne explained. However, CIDA expects the measure to be a short term one and cautioned against long term detrimental effects as it may artificially inflate the salaries of workers employed in the industry. CIDA is on an aggressive campaign to recruit new blood to the sector and have introduced new schemes to train workers. In 2017, the Authority trained 10,000 workers who are now engaged in the construction industry. However, according to Jeyachandran, the new entrants have been absorbed by housing scheme projects in various parts of the country. “This is why the construction companies engaged in major infrastructure projects still have a labour shortage,” he said. With the 2018 Vocational Training program being launched, he said, CIDA hopes to address the shortage.